All the Salvias we purchased from Flowers by the Sea arrived as you promised – well packaged, moist and healthy. But shortly after planting, there were a few days with temperatures between 90 and 100 degrees F. Some of my sages – the Salvia guaraniticas – have begun to wilt although I have been watering daily. They are located in shade until the afternoon when they get a few hours of direct sun. One now appears to be dead. Any suggestions? First things first. You can help your Salvia guaraniticas (Anise-Scented Sages) by rigging up some temporary shade to protect them during their hours of direct sunlight when temperatures are extreme. A simple tent made from newspaper or lightweight cardboard and sticks works well. I’m not in your garden, so I can’t give you a definite answer about what is going wrong. Plants may wither even if you regularly water them. 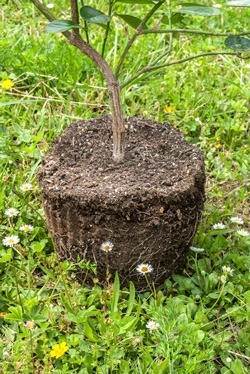 When the ground surrounding a new planting's root ball is moist but the roots remain dry, that indicates moisture isn't transferring properly from the outer soil. It may be that the root balls of these plants are drying out faster than their surrounding soil. This particularly occurs where soil is sandy and contains little organic matter to retain moisture. Or it may be that you need to improve your watering practices. It’s important to understand that when you purchase a plant, the soilless potting mix of its root ball is different from the soil in your garden. This dissimilarity impedes the transfer of moisture from the surrounding soil. Also, water moves more easily downward than laterally in soil. So, you need to concentrate watering close to the base of a Salvia’s central stem for downward flow. With many sages, you need to be careful not to water the so much that soil becomes spongy. However, in their South American homelands, Anise-Scented Sages grow in the wild in moist-to-wet soil. They have a greater need for moisture than many Salvias especially when getting established. Another thing to remember is that overhead sprinkling Is inefficient for any new plant you’re trying to establish. That’s because roots still need to grow beyond the root ball, and overhead watering sheds water away from the root ball. Soak the hole for replanting. Loosen up the root ball through scarification – a process in which you gently tease out roots to make it easier for them to absorb water. One way to do this is by prying roots apart with your fingers. Another method is to use the tines of a fork to lightly score and rough up the root ball. Soak the root ball thoroughly until it feels heavier (about 5 to 10 minutes). Replant your sage once the water in the planting hole has drained. Mulch the growing area with compost. Finally, create a shallow moat around the plant and water it in. Earthworms will draw the compost down into the ground, enriching the soil and causing it to retain moisture without waterlogging roots. If you unearth one of your Salvia guaraniticas and discover that it’s root ball is moist even though the foliage is suffering, don’t give up. These are tough plants. Call or email us at FBTS so we can brainstorm other possible causes and solutions with you.